The Condominium Act allows the creation of condominiums and sets minimum standards for their operation. It was enacted by the Provincial Legislature and is amended from time to time. The complete legislation is available for review through the Province's web site. Please click here for direct access. The Declaration that created our condo was drafted by the developer and constitutes the basic legal structure of the condo. All of its terms had to comply with the Act and can be overridden by changes to the Act. Depending on the alteration, changes to the declaration require approval of either 80% or 90% of the owners. A copy of the Declaration is available as a PDF document. Please click here to view the document. By-Laws deal with major operational matters in the condo. They must comply with the Act and the Declaration. The By-laws are passed by the board but are only effective if more than half of the unit owners vote to approve them. 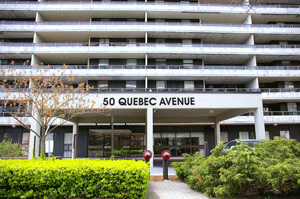 To view the current By-laws of the condo, please click here. Rules deal with the specifics of operational matters which may change from time to time, for example construction standards for renovations of units. They must comply with the By-laws, the Declaration and the Act. They are passed by the board and are effective 30 days after passing. If sufficient owners (15%) are unhappy with a Rule they can seek to have it overturned at a meeting of the owners. Rules can be enacted, repealed or amended by the owners by a majority vote at any meeting if there is a quorum. The condo's Rules are available in PDF format and can be accessed by clicking here. Policies are guidelines for the day to day operation of the condo by the board and the staff. They are passed by the board which can choose to depart from them in unusual circumstances. Staff is bound to follow them unless directed not to by the board. The board has been working for the past two years to address and provide guidance to staff to handle specific situations. You may wish to review the current Vision, Values/Guiding Principles and Code of Conduct documents to understand the high standards set for those responsible for our community by clicking here. As well, the Provincial government has introduced requirements for various policies to be established. Under the Accessibility for Ontarians with Disabilities Act [AODA] the board passed policies and procedures January, 2012 to address the requirements outlined in the Act. The policy may be reviewed by clicking here. The By-laws empower the board to constitute Committees. The primary role of Committees is to assist the board in facilitating the business of the corporation by researching issues prior to their consideration at board meetings. Committees are assigned specific tasks and encouraged to take minutes of their meetings and make reports and recommendations at board meetings. For details on the operation of Committees please click here. Individual committees may be accessed through the main menu by choosing Committees. Recreation Facilities - the swimming pool, tennis courts and adjacent easement areas - are for the common use of the residents of YCC323 and sister corporation YCC435. Two board members from each corporation act jointly under the auspices of High Park Green Recreation. The rules were amended January 2012 and may be accessed by clicking here.